Stencilling is an extremely effective way to quickly add impressive patterns and decorations to your cakes and cookies. 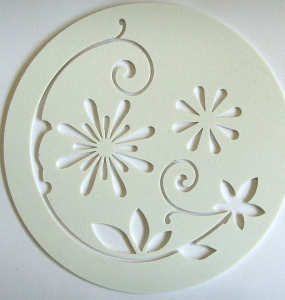 Designer Stencils line of Culinary Stencils are perfect for decorating cakes, cookies, fudge, brownies and pies. They can be used with Royal Icing, Luster Dust or an Air Brush to create the design on your masterpiece. There are various techniques you can use including dusting with edible dusts, using royal icing or simply using the stencil to emboss your sugarpaste and fondant.